This week in Nursery we have focused on Remembrance Day and Bonfire Night. 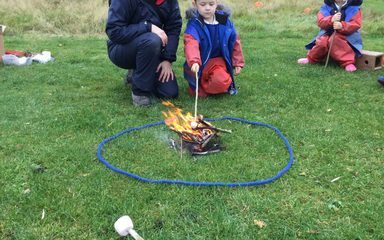 To finish our ‘Bonfire Night’ themed week off we made our own fire! To begin our session we learned about fire safety and how a storm kettle works. We used the storm kettle to make some hot chocolate and then to finish we roasted marshmallows. The children this afternoon also drew pictures of fires using some charcoal. There will be photographs available in nursery next week of today’s session to purchase for 50p. All of the proceeds will go towards funding future Forest School sessions as well as much needed cooking equipment for such session.